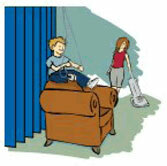 To ensure blinds comply with the new safety rules, all hazardous cords, chains and loops must be removed or restrained. There are now limitations on chain and cord length, to limit the amount of extra cord handing beneath the level of the window. Cords must also be fitted a cord safety device for extra security. We ensure that all of our products comply with the strict safety legislation, and include a cord safety device with every order. These safety devices allow cables or chains to be securely fastened to the wall, minimising the risk to children. Our Trade Partner will discuss this with you in person, after you have placed your order on Luxury Blinds Direct. When they visit your home to take expert measurements of your window, they will also advise if the blinds will require extra safety measures, depending on the placement and size of your window, to ensure the safety of any children or pets in your home. Blind cords and chains are the main issue with blinds safety, but once you are aware of this, there are a number of practical and simple precautions which you can take to create a safer environment. Position furniture a safe distance away from blinds and windows to prevent children from being able to reach them. Do not allow control cords or chains to hang close to cots or beds, or to gather on the floor. Do not allow control cords or chains to hang loose. They should always be secured out of reach, or a cordless control should be used. Never leave a child unsupervised in an area where there are potential safety hazards—even if safety devices have been installed. of reach of young children. Making our products safer for homes with toddlers and young children is a top priority for us. For this reason, every set of blinds you order will be accompanied by a cord safety device, which enables any cords or chains to be securely fastened to the wall, minimising the risk to children. A cleat is supplied with all Venetian, Vertical and Timber blinds, so you can safely secure the cord to the wall. A cord / chain tidy is supplied with all Roller and Roman blinds. This will keep the chain secured. Read the Make it Safe leaflet from the British Blinds and Shutter Association, or visit the Make it Safe website for more information on window blind safety.